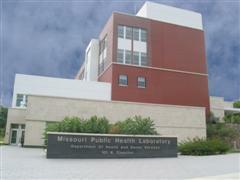 The Missouri State Public Health Laboratory is dedicated to promoting, protecting and partnering for health by delivering quality public health laboratory services. About five million tests (many required by law) are performed in the MSPHL and one branch laboratory located in Poplar Bluff. Approximately 406,920 mailing kits are assembled and distributed each year for the return of specimens from hospitals and private laboratories as well as city, county and district health offices. The MSPHL also functions as a reference lab for medical laboratories in the state and confirms results or completes organism identification.